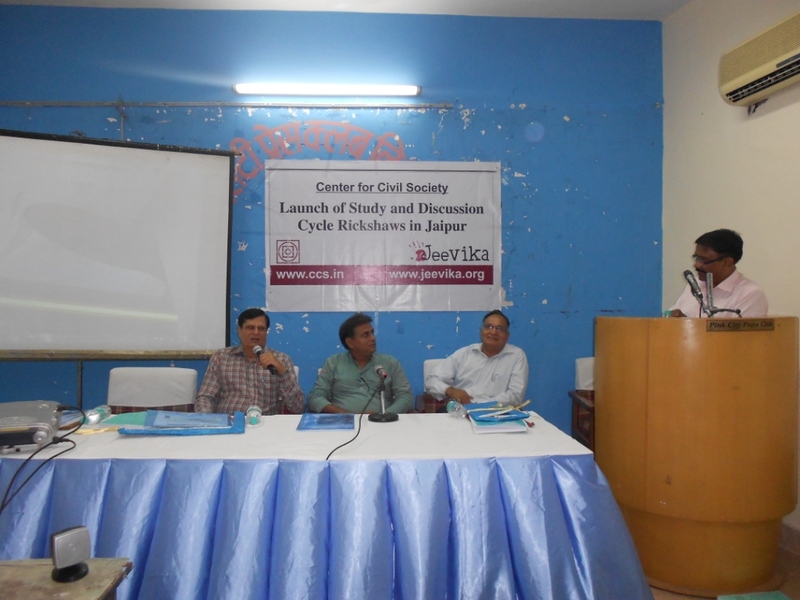 On Tuesday (10 July, 2012), Centre for Civil Society organized an event to launch the study on cycle rickshaws in city titled “Three Wheels on the Road of Regulation” and discussion on the same “Cycle Rickshaws in Jaipur” happened successfully. The event was marked by the presence of authorities and representatives from various departments and organizations. 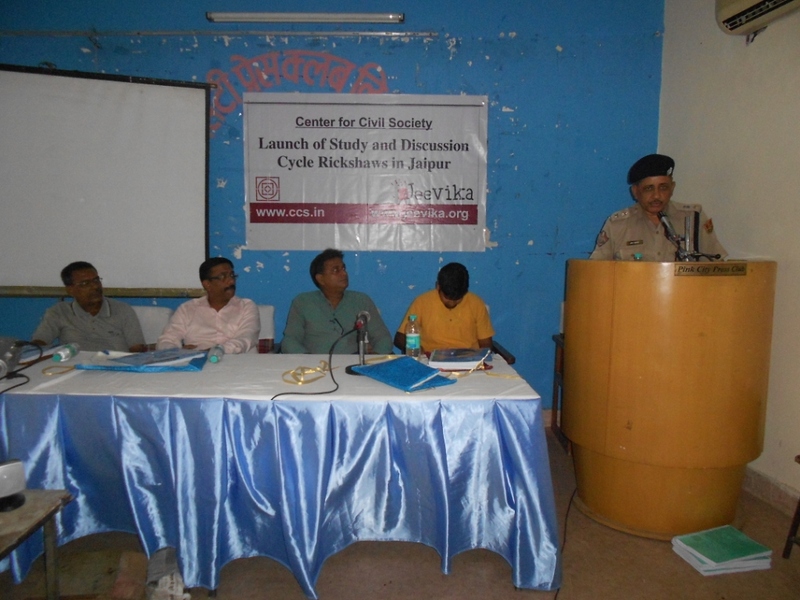 Speakers from all the departments concerning the subject of the study participated in the event and gave voice to the event by making their stands on the various issues related to the Cycle Rickshaw Business aloud. The main speakers present during the study launch event were Mr Manish Pareekh (Deputy Mayor, Jaipur Municipal Corporation), Mr Om Prakash Sharma (Additional Superintendent, Traffic Police), Mr P. N. Bhandari (Advocate, Rajasthan High Court), Mr K. K. Sharma (Superintendent Engineer, Department of Local Bodies), Mr Pramod Gupta (Labour Inspector, Labour Department), Mr Ashok Jain (Labour Inspector, Labour department) and Mr R. C. Sharma (Additional Diractor, Jaipur Metro Rail Corporation). Representatives of other organisations such as Kuhad Trust and Pravah Jaipur Initiative expressed their support both before and during the event. The whole Community Video Unit (Pravah Jaipur Initiative) which helped us in making of the documentary on cycle rickshaws was present throughout the event. 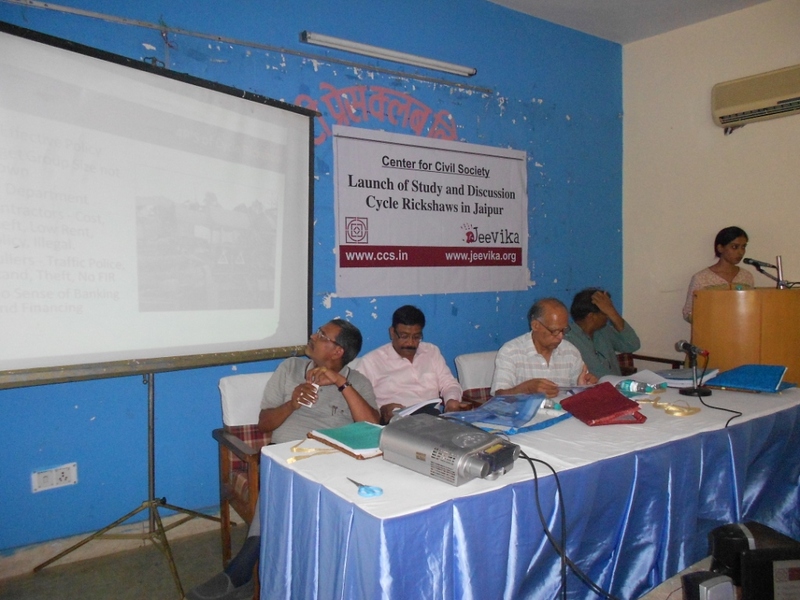 Representatives from Kuhad Trust which works on the micro financing of cycle rickshaws, were active speakers with their deep knowledge on the current status of the financial status of cycle rickshaw pullers in Jaipur. 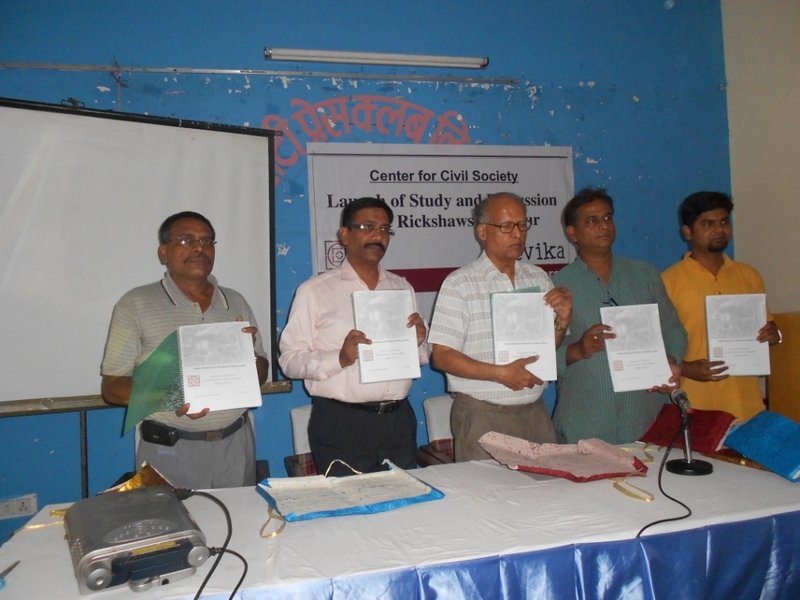 Other Organizations present during the event were ACCESS Development Services which works for and on micro financing and livelihood of marginalized workers, Jan Hit Manch, a social welfare group and Sphere India, a humanitarian agency. The subject of the discussion i.e. 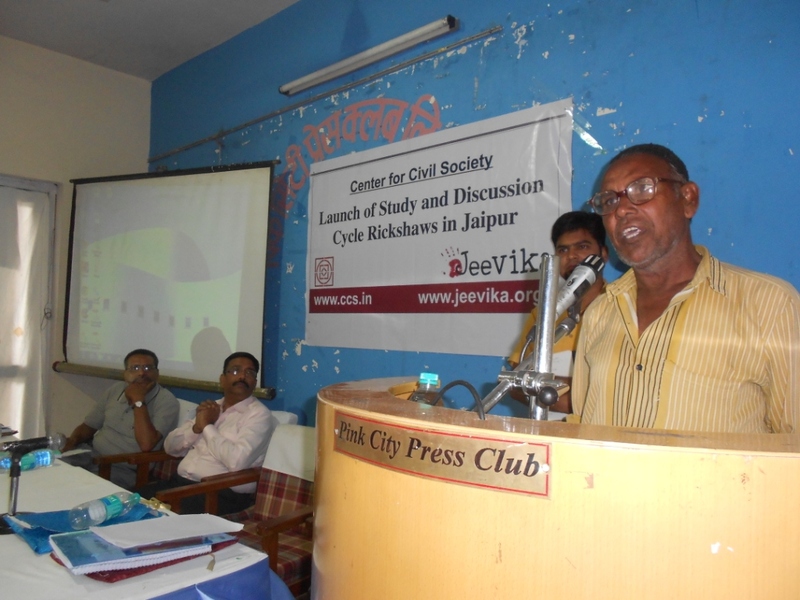 cycle rickshaw pullers also actively participated in the discussion. 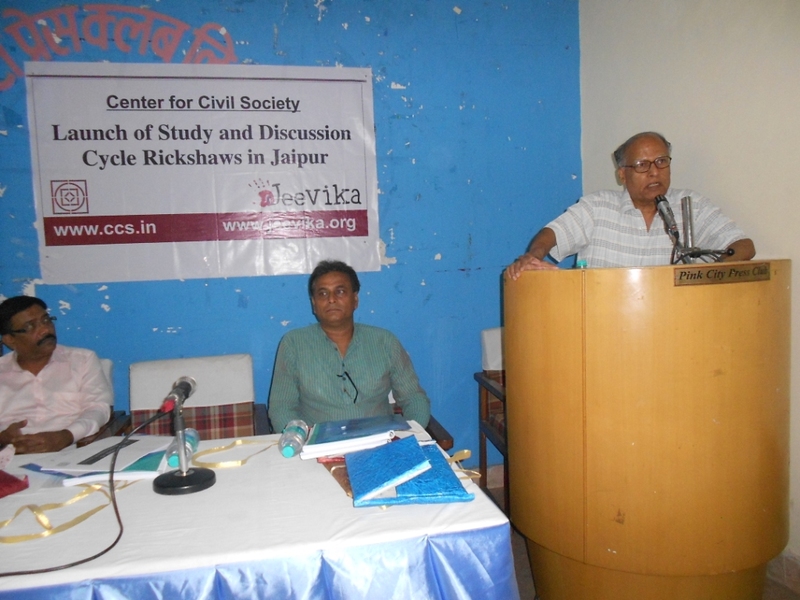 The event started with a documentary film on the cycle rickshaws in Jaipur named “Ae Rickshaw Wale”. 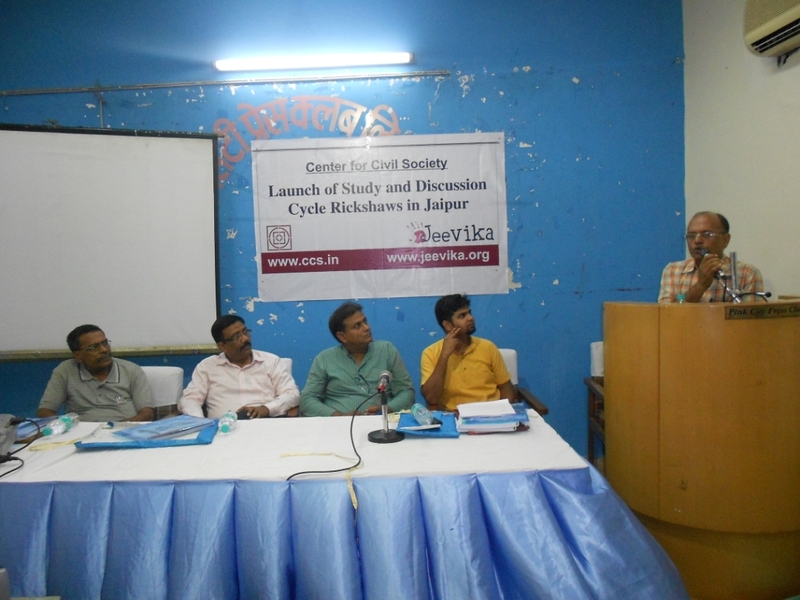 The Video projects the comment of all the stakeholders on various and specific points like advantage, disadvantage, problems, role of contractors, policies, social security schemes, registration and possible solutions to the problems of cycle rickshaw profession in Jaipur. Parties covered in the documentary are Rickshaw pullers, public, contractors and high authorities like Mr Rohit Mahajan (Superintendent of Police, Traffic), Mr Ashok Singh (Law Director, Jaipur Municipal Corporation) and officials from other departments (Labour Department and Department of Local Bodies) answerable for the cycle rickshaw profession. 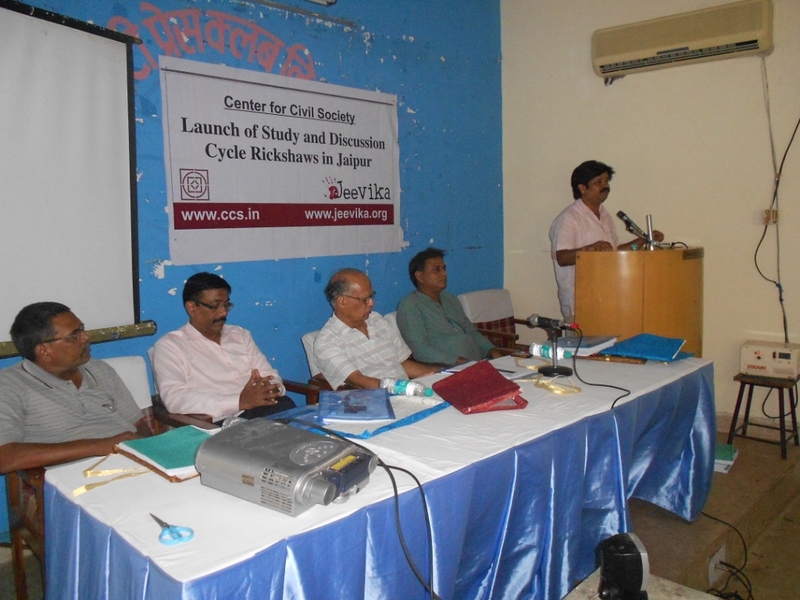 Subsequently a brief presentation on the findings of the study on the cycle rickshaw in Jaipur was given by Researc Associate at Centre for Civil Society, Ms Aprajita Sharma. 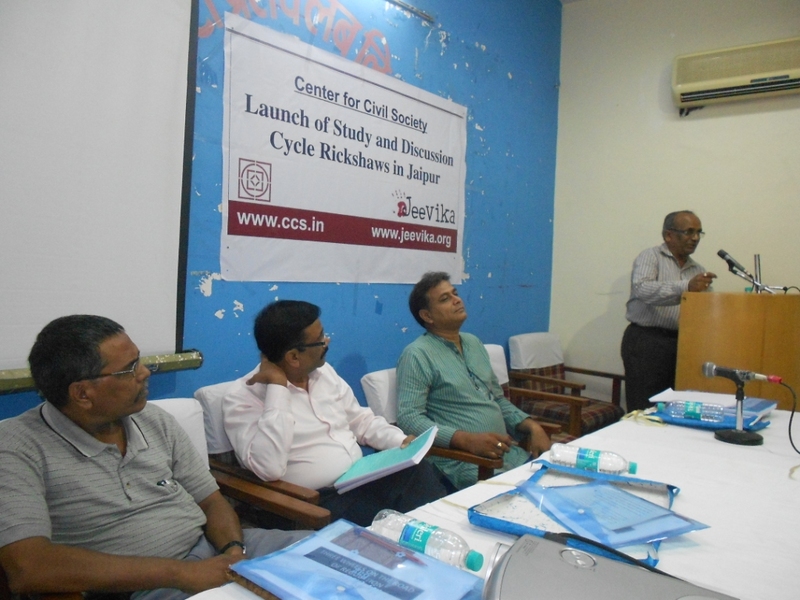 The presentation highlighted the basic findings of economic status, social status, income and expenditure mode, financial status, awareness of government schemes, problems, policies, legal history and suggestions for the improvement of the status of cycle rickshaws. 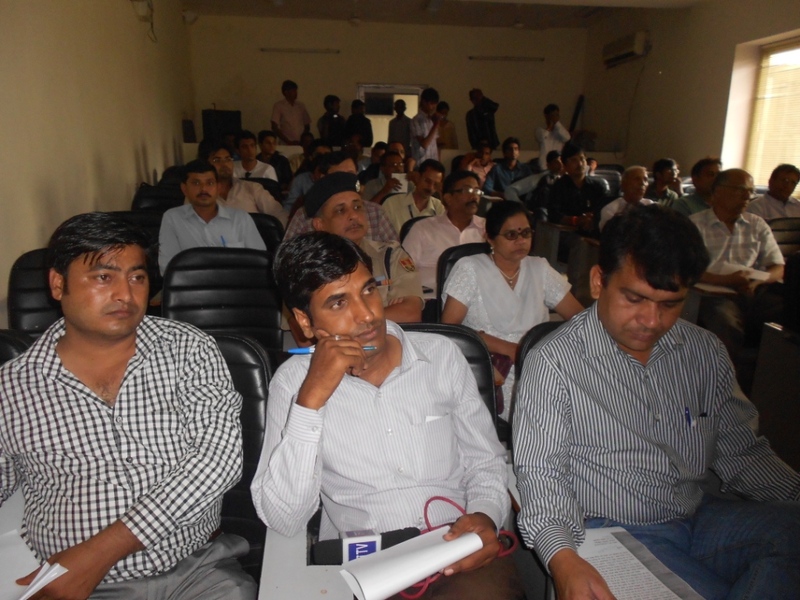 The event progressed further with the comments by all the speakers. The discussion was contributed by questions to government officials from media and other organization’s representatives present during the event. 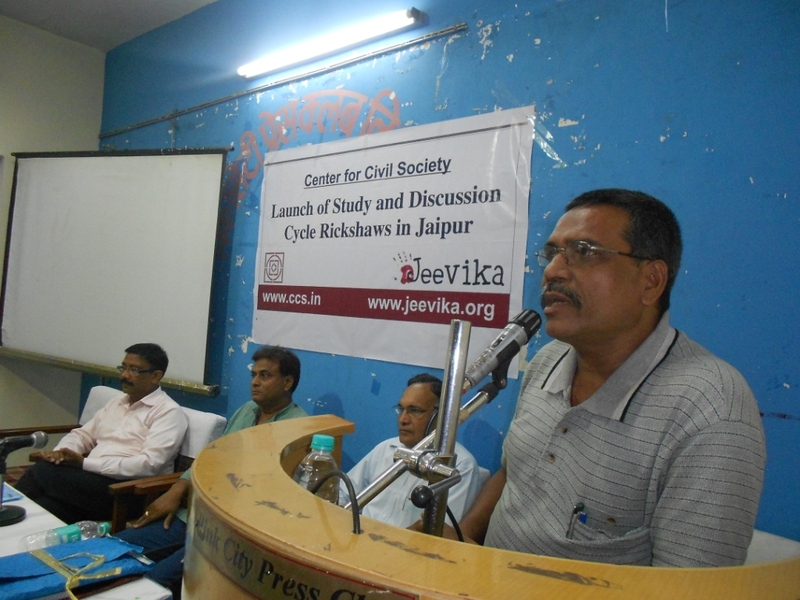 Moderation of the event was done by Mr Amit Chandra, National Coordinator of Jeevika Campaign. 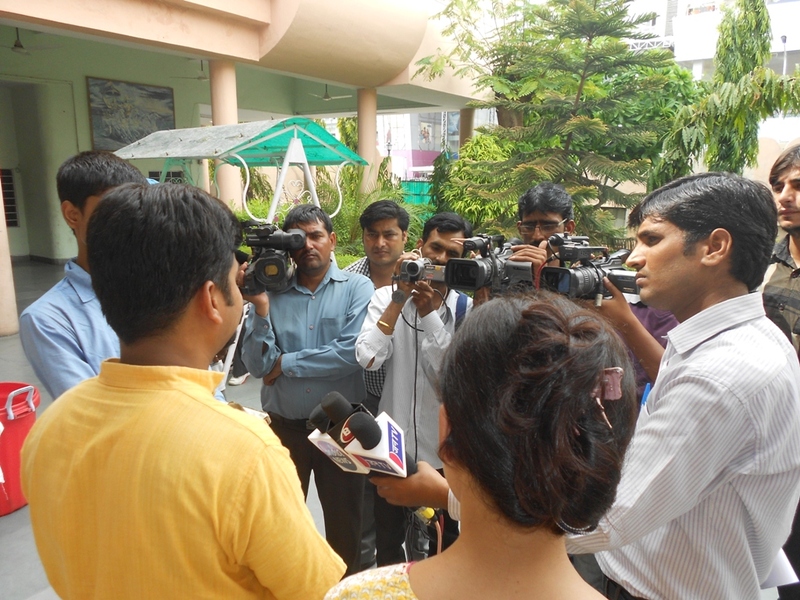 Media Coverage of the event was done by around 25 correspondents from various print and electronic media agencies.